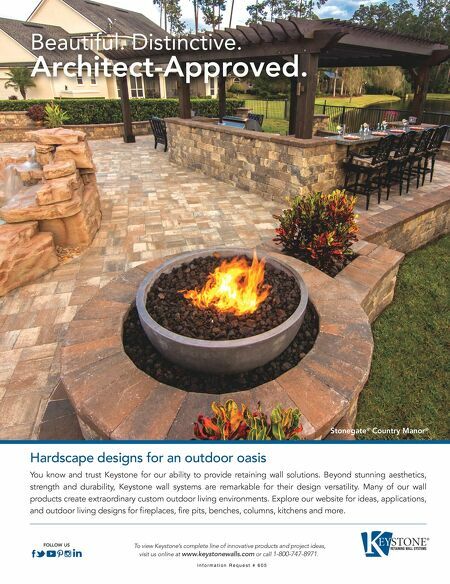 Continued on page 16 14 Landscape Architect and Specifier News h a rd s c a p e s Commercial office properties have always had to contend for tenants as a part of doing business, but increasingly, existing buildings are facing stiffer competition from new office properties offering integrated amenities packages that go way beyond the lobby coffee shop. As a new generation of employees enters the workforce, employers are challenged to secure leases that provide more than simple office space, instead offering an attractive combination of recreation, retail, and relaxation options that feel more akin to a resort than a workplace. In the case of Prudential Plaza, a 41-story structure in Chicago built in 1955, the challenge for building owners was to offer new value in a building originally designed to respond to a workforce that no longer exists. From this desire for new renovations, Wolff Landscape Architecture and Solomon Cordwell Buenz transformed the flat, empty roof of the plaza into an inviting roof garden filled with amenities. Investing more than $85 million into building renovations, Prudential Plaza's owners envisioned a top-to-bottom rehabilitation, crowned by a 13,000-square-foot amenities deck on the 11th floor. Kyle Kamin, a CBRE Inc. executive vice president and tenant broker who has clients in Prudential Plaza called the roof deck "a game-changer with an unbeatable view." 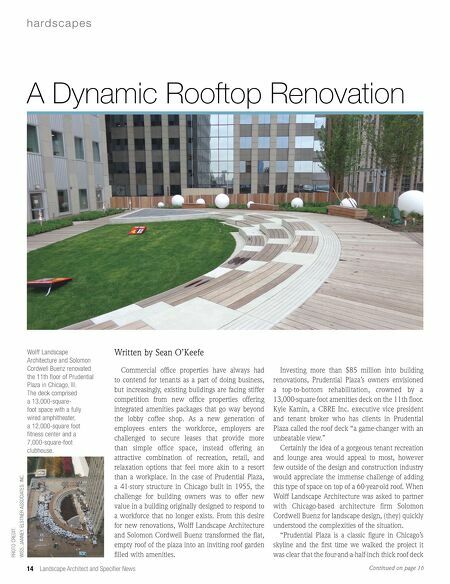 Certainly the idea of a gorgeous tenant recreation and lounge area would appeal to most, however few outside of the design and construction industry would appreciate the immense challenge of adding this type of space on top of a 60-year-old roof. When Wolff Landscape Architecture was asked to partner with Chicago-based architecture firm Solomon Cordwell Buenz for landscape design, (they) quickly understood the complexities of the situation. "Prudential Plaza is a classic figure in Chicago's skyline and the first time we walked the project it was clear that the four-and-a-half-inch thick roof deck Written by Sean O'Keefe A Dynamic Rooftop Renovation Wolff Landscape Architecture and Solomon Cordwell Buenz renovated the 11th floor of Prudential Plaza in Chicago, Ill. The deck comprised a 13,000-square- foot space with a fully wired amphitheater, a 12,000-square foot fitness center and a 7,000-square-foot clubhouse. PHOTO CREDIT: WISS, JANNEY, ELSTNER ASSOCIATES, INC.